1/5 Saturday, 1130.9, 73/50, sunny, WNW10-20 - Temperatures were slightly cooler last evening and we slept very well. Maxwell woke us up around 7am demanding his litterbox and breakfast. After his highness was attended to, we enjoyed a leisurely breakfast. A visitor stopped by while we were filling the water tank. 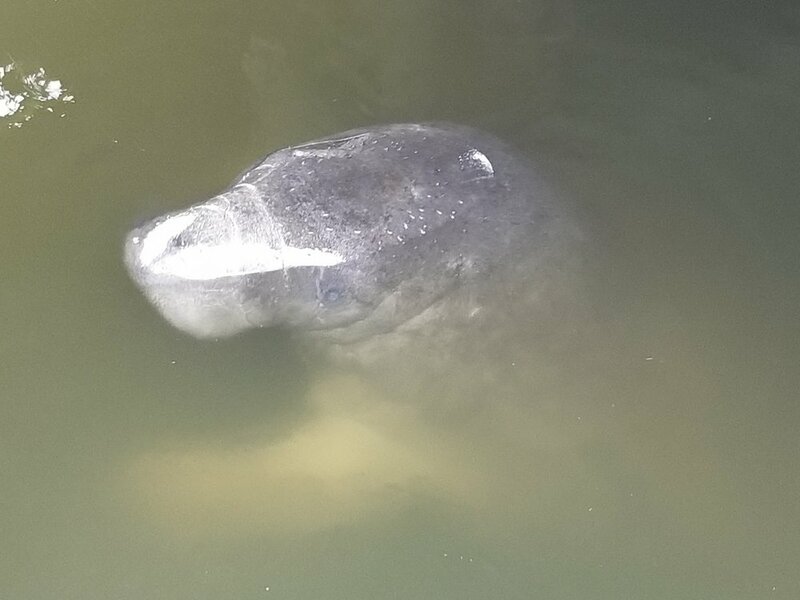 Manatees must be able to sense even the smallest quantity of fresh water - the few drips falling from the hose connection. The forecast had a good breeze filling in, so at 10am we headed out for a sail. We were prepared to go all the way to Eau Gallie, 35nm, if the wind allowed. It was a spritely sail - 1st reef main and full to 2nd reef jib depending on how it was gusting, and we did easily make Eau Gallie. Unfortunately this once pleasant, well-protected anchorage is now choked with a sunken ketch and roughly ten permanently moored boats (of the not-ever-going-anywhere-again variety) in a space that Skipper Bob’s describes as fitting two boats. I don’t think the state or town, after the hurricane, has anything left to enforce the 72-hour anchoring limit. It’s such a shame to see the residents of Florida being taken advantage of this way. I’m sorry I came. On our way in, the engine started to overheat. It’s like we have a blockage somewhere in the engine that we can’t pinpoint or clear. Flow is good through the seacock, strainer, and water pump. Dobbs can blow through the engine plumbing and air seems to flow okay. The vented loop is working fine. We yanked the thermostat and that helped improve flow - some rusty-looking water came out initially. The raw water in our engine mostly recirculates until the temperatures reaches 130-140-degrees; then the thermostat opens and lets water flow through to the exhaust (there are pin holes in the thermostat so there’s always some water flowing). 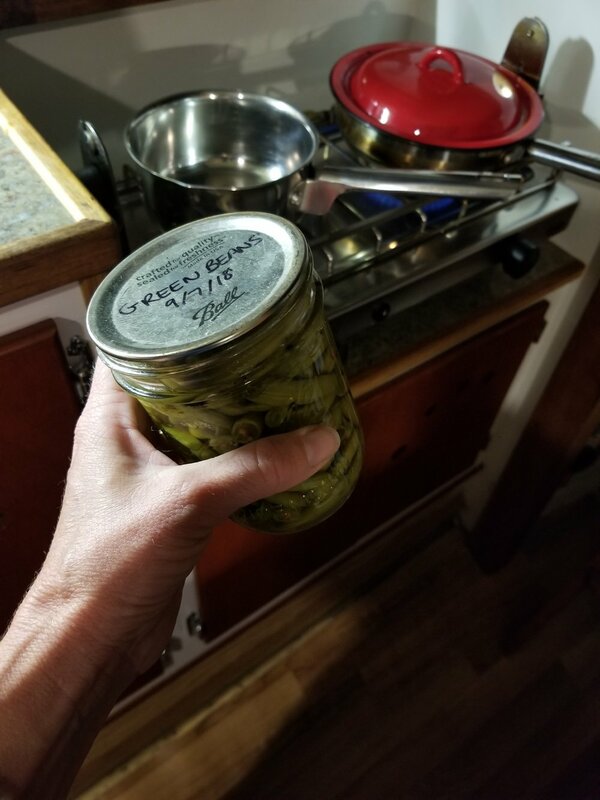 While the thermostat itself seems to be working okay (we tested it in a pot of hot water), I’m of a mind that it is at least contributing to the problem. When we made the trip in 2015/16, it was stuck open and we didn’t realize it wasn’t supposed to be (‘cause every other engine we’ve ever met pumps water continuously), and the engine ran fine. I’d like the engine to be able to run at about 130-degrees or less, but if I have to choose between cold but pumping water and overheating, I’ll take cold but pumping. We dropped our hook in the only available spot, with the engine temperature at 175-degrees, and it took a second try to get the anchor to set. We’re closer to the marina than we’d like to be, but the boaters there seemed to understand our challenge and appreciate that we care about our boat and theirs too. After trouble-shooting the engine until we ran out of ideas, we sat in the cockpit in the glow of the setting sun, eating a snack and dolphin-watching. They were very active, splashing and back-swimming and swirling around. A small type of fish is running here right now, so not only are there dolphins but plenty of pelicans dive-bombing, too. Murphy was on full alert. We launched Coquille and Dobbs rowed Murphy to shore. I heated up leftover pork roast and mashed potatoes with some corn and green beans. Again it’s 8pm and I can hardly keep my head up. It’s time I admit I have all the symptoms of depression - I’ve been here before, but not in a long time. Two months of boating-induced almost daily stress has pushed me to where I’m not recovering in the normal “shake it off - tomorrow’s another day” way. I have happy moments, but I could easily fall to tears in the middle of playing tennis on a sunny 80-degree day. Dobbs has been with me for 20 years - almost half my life - so he’s seen me struggle like this before and he’s the best companion I could wish for. I’m trying to do things that I think will help me heal, because I’d really like to get back to seeing the beauty around me. I’ve debated sharing this aspect of our cruise, but I endeavored to share the whole experience and sometimes, for some cruisers, this is part of it. Time to wash the dishes.